Email marketing is the most valuable asset to your business. It allows you to reach your targeted audience, measure your performance and build relationships with your customer contacts. 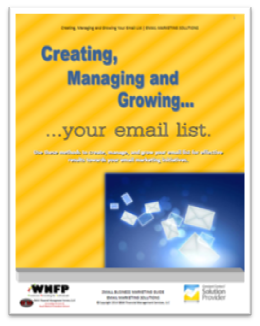 Using these methods to create, manage and grow your email lists can result in effective results towards your email marketing initiatives. Download this free guide to learn how to implement these strategies for boosting the number of subscribers on your email list. Complete the form below and the eBook will instantly download. In addition to receiving this instant eBook download, you will receive "Email Marketing Tips and Solutions" via email to help you communicate with customers and prospecting using email marketing campaigns.